When producer Max Gordon came to John D. Rockefeller about investing in a musical based on Johann Strauss’ relationship with his father, set to Strauss’s most popular melodies with new lyrics, and a book by Moss Hart, he had no idea that Rockefeller would not only say yes, but offer the brand new Center Theatre, part of the brand new Rockefeller Center. 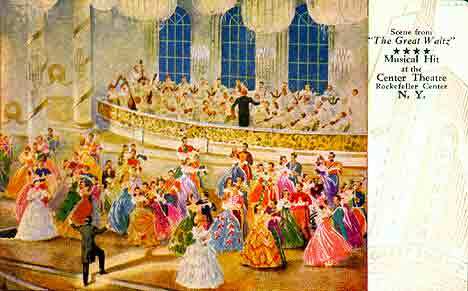 The Great Waltz, as the show would be called, was the first production in the 3,000 seat theater. Directed by Hassard Short and designed by Albert Johnson, the show had a cast of 180, over 500 costumes and massive sets that moved by an innovative hydraulic system. 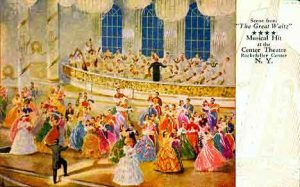 The “Blue Danube” finale brought a 53-piece orchestra up from the depths, eight crystal chandeliers down from above, and the entire cast waltzing on in lavish period attire. It was the biggest spectacle Broadway had ever seen. Most critics like but were not bedazzled by the spectacle, but ticket buyers packed the theater (now the site of Rockefeller Center’s parking garage) for months, making the show a profitable hit. 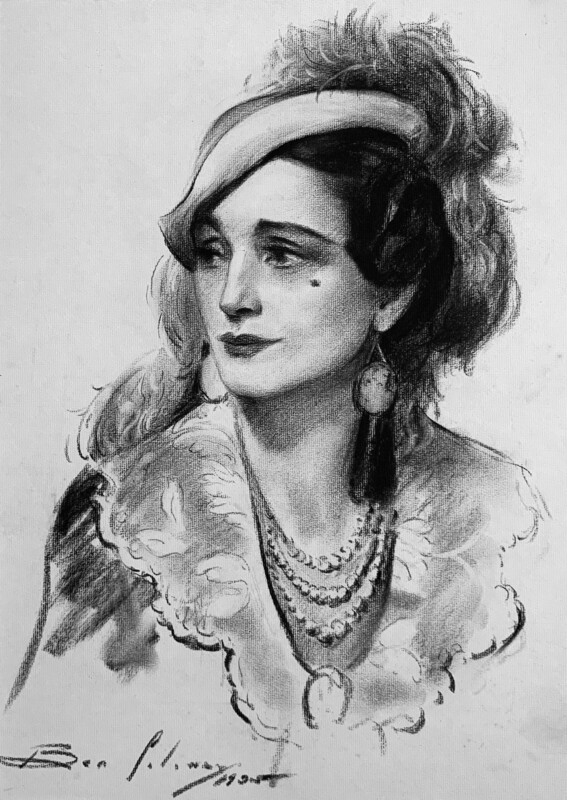 Marie Burke, an English actress had trained as an operatic singer, but found more success in stage musicals. She had been playing on Broadway since 1910. In The Great Waltz as Countess Olga Baranskaja, she effects the reconciliation between father and son Strauss leading to the panoramic finale. Ben drew her from life and his work appeared in thejust before the show took a summer hiatus. It was her final appearance on Broadway, but she continued in the West End, as well as in films, and eventually television.